About once a week, I get an e-mail or question from someone about the best way to carry a handgun in the car. There are a number of things that have to be considered when you both asking that question and answering that question. Do you want to carry on body or off body in the car? What hand do you shoot with? Are you looking for a holster that is actually mounted in the vehicle? If so, does it have to be concealed if someone happens to glance inside the car? What are the legal implications for carrying concealed in a vehicle in your state or county? Does the set-up need to be designed so that you can carry the same holster both in the car as well on on your person? The average person has to decide if the holster will be a permanent mount in the car or one that can transition to other carry situation. In the case of a permanent mount, you'll need to try to find a mounting location where you can quickly access the weapon with your strong hand and keep it somewhat hidden as well. According the data from the 2008 UCR (Uniform Crime Reports), most handguns are stolen from vehicles versus residences. Once you have selected a mounting method and location, you have to decide what the most comfortable way to access the handgun. 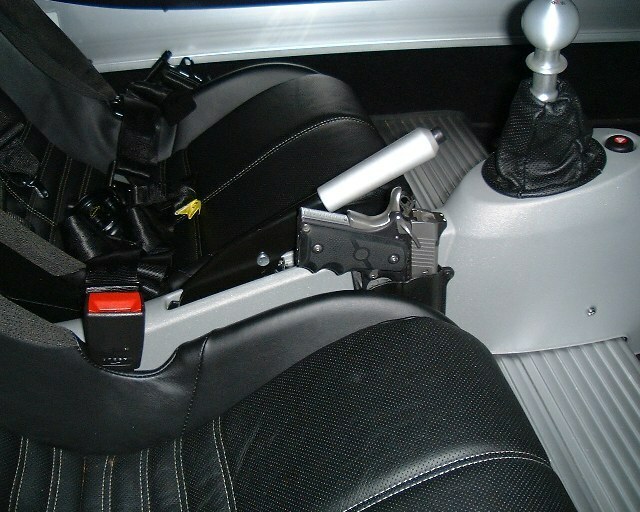 I personally am right handed so I have a G-CODE kydex holster mounted to the right hand side the center console. It's not readily visible from outside the car (I have a CCW permit as well), but I can access it pretty quick if needed. The weapon I keep as a "car gun" is a Taurus PT-145 as it's a durable weapon that isn't too expensive, should it be stolen. I certainly wouldn't feel comfortable using my Kimber Ultra Carry Custom as a car gun as it would break my heart if it were stolen. Although this isn't a pic of the set-up I use, it's pretty close. Something like this works great for me. Test a few things out and you'll figure out the best solution for your needs. Holsters which are designed for handguns are made in a broad variety of shapes, materials and release mechanisms. As a result of the big range of holsters, you will find as numerous methods in which a holster could be used depending upon the user's preference. They have been used in the form of easy leather pouches which were hung from a belt to very sophisticated and protective leather holsters with flaps covering the whole pistol. Then there are the competition holsters which hold the gun at a precise position so that it releases with pressure, These holsters are spring loaded. Worn by people of uniform, police and even by the military. These holsters are designed to be carried in plain website to become openly seen where is no reason to conceal the weapon. In fact, being capable to retain the weapon is as critical as keeping the hands of the bad guys off of it. Usually the holster is constructed of leather. Their appearance is as essential as its functionality because it is usually part of the uniform and has particular specifications to become considered in conjunction with the uniform. Most are polished to a shine and made to become harder to remove. It would be a disaster for a weapon to fall from a police officer's holster or worse yet for a "perp" to become able to easily obtain the weapon. Worn by plainclothes law enforcement too as those who have obtained a Conceal and Carry license which is allowed in numerous states. These holsters are made with the idea of concealment. Frequently they're small and simple to hide. One generally wears these holsters under their clothing and are totally out of sight. 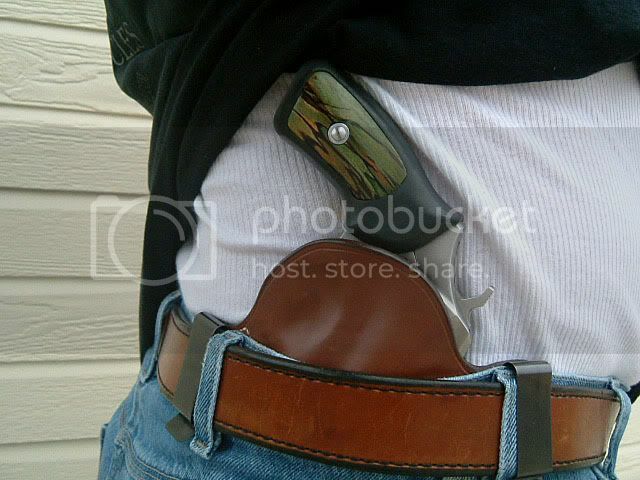 Since the holster is worn close to the user's body, comfort is usually really important. As a result of the broad profile of the holster a broader distribution region for comfort is possible. The fact that the outside of the conceal holster is spread over a large area also makes it difficult to be revealed on the outside from the clothing. Worn by sport shooters and hunters. These holsters are obtainable in the widest range of options. You will find these holsters with quick access for fast draw shooting too as providing high protection from the elements when hunting with your pistol or when carrying it in the field. You will find also those holsters used for "plinking" (shooting for fun). 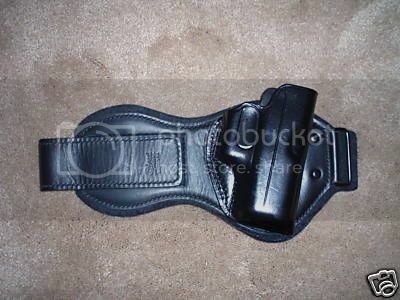 As with any sporting equipment the range of sporting holsters is as varied as the users themselves. So when you are in the shopping mode for holsters, it is greatest to consider these types and the functions you are trying to incorporate in your shooting. Appreciate your hunting, shooting, or protection shooting with the correct leather holster. Weapon finish wear - Here's one that's a hot topic, and probably the most commonly asked question I receive regarding kydex holsters. Before I get into addressing this issue, it's important to understand some concepts. Finish wear on a weapon comes from friction that occurs when the weapon is un-holstered and re-holstered. Over time, that repeated friction causes wear on the weapon. Friction wear occurs on weapons no matter what the holster is made of. Actually you could cause finish wear on a weapon using your finger, if you rubbed in the same place over time. Likewise, any poorly fitting holster, no matter what the material, can cause wear on the weapon finish. Now do kydex holsters cause wear? Yes, they will. However, the level and degree of wear will depend on several factors such as the quality of the holster, fit of the holster, and amount of use. Let me explain a bit more: leather holster rely on tightness of fit for retention. Kydex holsters typically provide retention through specific points within the holster that "grab" onto the weapon itself. These specific retention points are usually located around the trigger guard, and front of the muzzle (front slide area for semi-automatics). Over time, repeated holstering and unholstering will most likely cause some finish wear at these points. In a quality kydex holster, the amount of wear is usually dependant on the frequency of draws and re-holstering. I had an interesting experience this Easter as I went to a small family reunion of sorts and had a relative bump my handgun during a hug. This triggered a somewhat public series of questions about what "that" was and why I was carrying a gun, etc., etc. I bring this up and you as a CCW holder probably need to prepare for this possiblity. Lucklily, this isn't the first time I've experienced this situation, so I was fairly prepared with my responses. My suggestion is to approach the issue in a low key non-threatening manner. No matter how qualified and safe you are, guns make some people nervous, period. I politely and discreetly told my aunt, that I was carrying a concealed pistol to protect my family and I was lawfully licensed to do so. I even went so far as to phow her my CCW permit and provide some limited statistics about CCW and crime. It's important to come across as intelligent and non-threatening in these situations as not to be labeled a "gun nut" or some other sterotype associated with gun ownership. Don't make a bid deal about it and downplay the situation. While showing your permit is acceptable, I wouldn't display your weapon even slightly. Don't lift your shirt, or anything like that. Once you feel that you have addressed the situation, move on as if nothing ever happened. Once I spoke with my aunt for a few minutes openly and honestly about protecting my family, she moved right into a conversation about my kids. If confronted or questioned on this matter, then is not the time to enter or defend any gun control issues or current gun related political issues. While I'm not saying speak up for your rights or your causes, be aware that even sub-consciously, other people may feel threatened by pro-gun talk while you are carrying a weapon. Being prepared is far better than adopting a "deer in the headlights" approach and becoming defensive. If you asked a group of shooters, law enforcement officers, or concealed carry permit holders to recommend the "best" ankle holster, you are going to get a wide variety of responses and suggestions. Having tried nearly every ankle holster made during my law enforcement career, I'll be glad to give you an opinion based on my own experiences. My suggestion for the best ankle holster you will ever buy is the Alessi ankle rig. It is hands down the cadillac of ankle holsters and outperformed everything else I've ever tested. My original Alessi ankle for my S&W J frame is over 15 years old but performs as well today as the day it left the Alessi shop. Since that time, I've ordered another 4 from Alessi for various other ankle guns and haven't been unhappy with any of them. The only downside to an Alessi is the fact that you will definitely have to wait at least 1 year to get it (unless you happen to find a deal on one locally or online). Alessi's aren't cheap so expect to pay a premium price for one. Don't let that stop you though, as you will not be disappointed. Leather - Leather the oldest holste material currently being used. Leather isn't too difficult to work with, but the price flucuates based on availability. Treated leather is somewhat water resistant, but now waterproof. Leather can and will absorb water over time. It can also retain water and may begin to smell. Kydex - Kydex is a thermoplastic material that has become increasing popular in the holster industry. Some holster manufacturers only work in kydex while others work only in leather. Kydex is very durable and impact resistant. However, it's not unbreakable as it can and will break. Kydex is completely waterproof and resistant to most every chemical. The biggest enemy of kydex is excessive heat as it can become soft and lose it's form. There are a number of rumors on the internet that kydex "scratches" a gun finish. This isn't exactly true. If hard debris like sand or grit were to be trapped inside the holster interior, it could potential scratch the weapon finish as the foreign material would be trapped between the holstered weapon and the holster interior. 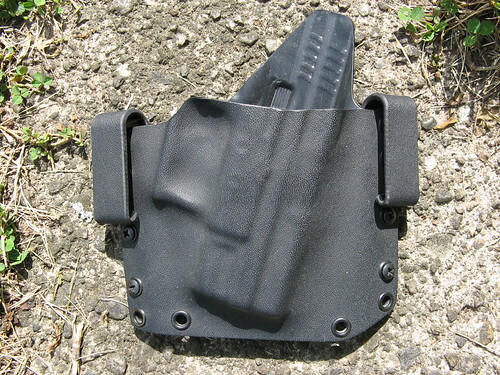 Kydex does retain a holster differently than leather and longterm, repeated draws from a kydex holster can and may cause wear at the contact points where the holster retains the weapons. Those points are the front of the muzzle and trigger guard area. Either material works well for gun holsters, so it really comes down to personal preferences.